Louisa Brockhurst is on the run—from her friends, from her family, even from her dream of independence through the Governess Club. But sometimes it's easier for her to hide from those she loves in order to escape the secrets of her past. Handsome but menacing John Taylor is a prizefighter-turned-innkeeper who is trying to make his way in society. When Louisa shows up at his doorstep, he's quick to accept her offer to help—at a price. He knows that she's hiding something, and he can't help his protective instincts toward the beautiful woman. Their attraction grows, but will headstrong, fiery Louisa ever trust the surprisingly kind John enough to tell him the dangerous secrets from her past that keep her running? Or will the power of her feelings scare her into running yet again? 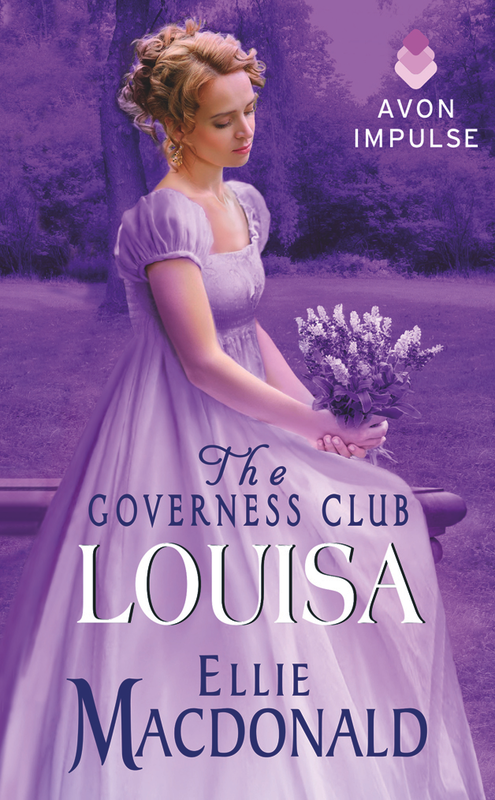 Louisa is available for pre-order now, releasing on October 7, 2014! ... with Bradley Cooper's latest bulked up body look. Louisa watched as the giant moved behind the bar and men carried their empty tankards over. He filled them, taking coin as he did so, laughing and talking with his customers. She swallowed when his eyes finally fell on her and Louisa flexed her grip on her portmanteau unconsciously. When he filled the final tankard thrust at him, the giant wiped his hands on a towel and walked over to her, his long strides eating up the distance. “Hey, Johnny, that some new entertainment?” One drunken shout carried over the others. Ribbing followed that statement, Charlie getting jostled and hit by his friends. His scowl lasted only a moment before he was grinning again at whatever was said. Louisa regarded him, silently weighing her options. The rain had not let up outside and there was no other inn in the vicinity. She truly had no choice but to stay at the Beefy Buzzard, God help her. Louisa hesitated a moment before placing her hand in his. It was immediately dwarfed in his large one as he shook it. Warmth surrounded her fingers and seeped in, warming her cold skin. “Mrs. Brock,” she replied, trying to not betray her reaction to the handshake. This alias had served her well these past months. “I am a widow,” she said, sharing the story she had decided upon. It was less remarkable for a widow to be a solitary traveler than a young woman. “Indeed. Let’s get you into your room and warmed up.” He gestured to the stairs but Louisa did not move. Mr. Taylor shook his head. “We can discuss this in the morning. You are in need of a bed and a warm bath, it appears. Let’s get that sorted first, shall we?” He relieved her of her portmanteau before she could protest and lumbered off in the direction of the stairs. The crowd parted at his large approach, leaving a wake of leering drunkards. Louisa lifted her sodden skirts and hurried after him up the stairs. The corridor was darker than the pub below it, only three sconces lighting the entire area. He opened a door at the far end and disappeared into it. Louisa hesitated at the door, unable to see into the darkened room. The sound of her portmanteau falling to the floor reached her ears. Footsteps came from the darkness, approaching her. Louisa swallowed when Giant Johnny stepped into the meager light, holding a candelabra. She stepped to the side when he didn’t stop and watched him use one of the remaining wall sconces to light the brace in his hand. He returned to the room, the candles providing a faint circle of light around him. She watched as he knelt down and used one of the candles to light the coals in the hearth; light and heat began to creep into the room when he succeeded. He kept his eyes on her, still standing in the doorway. “Are you in the area for long or just passing through?” he asked. Louisa blinked. “I am uncertain. My plans are currently in flux.” As they had been since leaving Ridgestone over two months ago. Louisa swallowed, knowing she had been inexcusably rude. Even with that knowledge, her apology stuck in her throat. She turned her gaze to the door, unwilling to allow him to see whatever emotion there might be in her eyes, and nodded. “As I said, I will accommodate you,” Louisa repeated. “Thank you.” With a nod, Mr. Taylor closed the door behind him with a definitive click. Out in the corridor, John released his grip on the doorknob and shook his head. The lady may look nice, but she had the tongue of a viper. Even dripping water on his floors and lips blue from the cold could not disguise her charms. Charms that were less appealing once she spoke. Shaking his head again, he returned to the crowd below. Even a man such as him knew to stay away from such creatures, especially if he wanted to keep all his important parts in working condition.